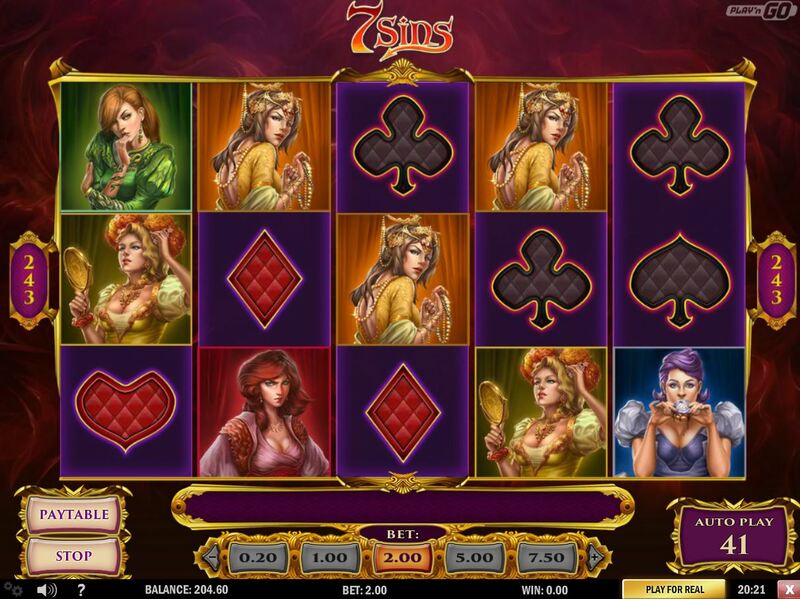 7 Sins slot is based around the 7 Deadly Sins of Greed, Sloth,Envy etc. which makes the theme unusual - no dragons, animals or cartoons (yawn!) here! The game is 5-reels and 3-rows 243-ways and has a number of unique characteristics. There are card symbols like diamonds rather than the usual J, Q and K for the lower pays and the 7 Sins form the rest. All symbols are single-stacked. Should 2 scatters appear and thus no trigger, you get a graphic of the 7 Sins using their allure to tempt you. Choose one and you'll get nothing, 2-15x stake or the third scatter. A nice touch to make the usual doom of 2 scatters more interesting. Now, either via the 7 Sins or 3 scatters straight in, you get the free games. There are 7 of them and each Sin is frozen stacked on the middle reel in turn. The outside 4 reels spin slowly and you may collect a decent win or nothing, literally, as aside from the Sin symbol for that spin, the reels are blank with no Wilds either! The first spin is at 1x and each successive spin raises it once so the final spin is at 7x multiplier.